A little piece of history died today, as the last ever typewriter to be made in the UK rolled off the production line at Brother in Wrexham. Think of that – the last typewriter! It’s qwerty-fiably sad. my iPhone and Filofax, keep a well-stocked pen pot and come over quite peculiar when confronted with a full display of Moleskine notebooks. I write all my appointments in the Filofax on my desk. Occasionally a child will come along and add a smiley face if they approve of the upcoming event. Admittedly I have never caught which child it is that might be doing this, and it is always possible that it’s Dennis the cat that’s adding all those smiley faces. 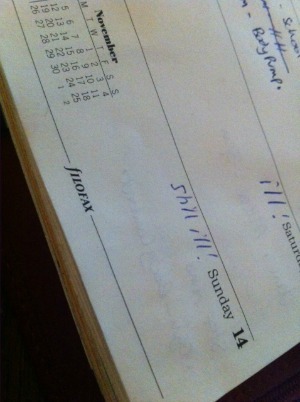 I have a second Filofax that I decant each year’s diary to when I put a fresh one into my main one. So if you want to know where I was on March 7th 2008 I am ON THAT (actually it was the junior school film night). When I am coaching somebody on the phone I always take notes by hand and encourage them to do the same. I also encourage coaching clients to start keeping a journal. There is something very special about the physical process of writing things down with a pen in your hand straight on to paper. It moves your mind and produces unique insights. Keyboards will never totally replace that. Typewriters may be becoming extinct but pens are here forever. So you can understand why I had to retire to a dark room and breathe into a paper bag when asked to become an official stationery tester. Cross Pens have asked me to join their review panel. Essentially what this will involve is them sending me some of their latest range and me telling them whether I think they’re nice pens or not. They haven’t asked me to blog about it, which of course is psychological catnip to bloggers and sure to send us straight to the computer. So to kick things off I was sent the limited edition Year of the Snake pen, which is so posh that it comes with its own plinth. 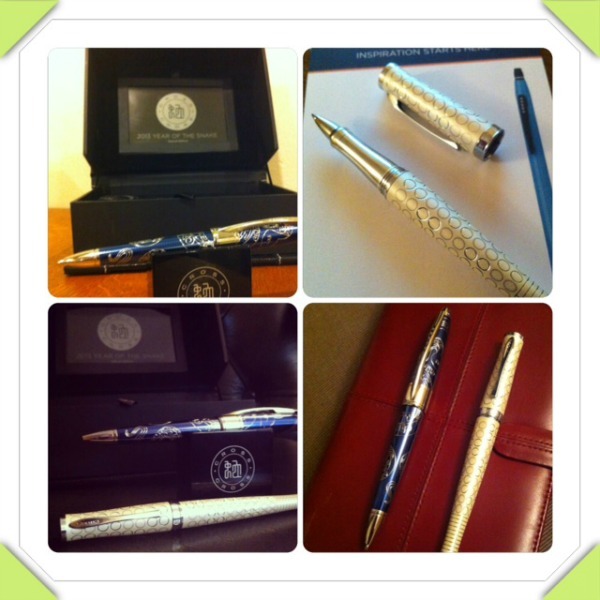 Plinth, as Miranda Hart has noted, is the King of Words, so this must indeed be the King of Pens. I was also sent a Forever Pearl rollerball, which is really gorgeously designed piece of writing kit. I can see this making a lovely christening or wedding gift. I must admit it has been kind of strange to have in my custody two pens whose value is more than I would spend on food in a month. The interesting part has been the extent to which they have an effect on what I’m writing – you wouldn’t use either of these for your shopping list. 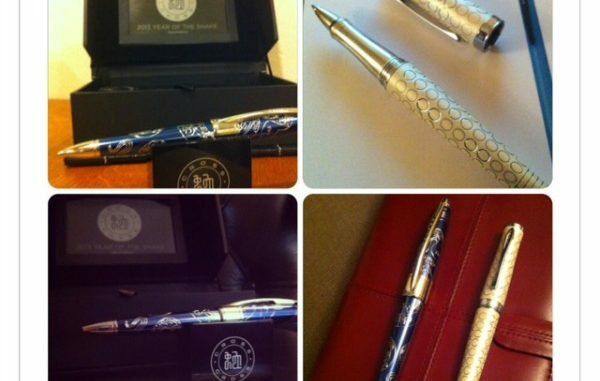 The one time I bought a really posh pen like this before it was for my father’s 60th birthday. When he died a few years later the pen came back to me. You really feel a connection with someone when you use a pen they’ve held and written with. I’ve told my kids they can have these when I join The Cloud, or if my fingers drop off through overuse. One interesting side effect has been on my kids – their handwriting becomes a million times better when they’re using the Cross pens. So if you want to help someone improve their handwriting, the answer seems to be to give them a decent pen to inspire them to make an effort. So they’re very much not disposible pens. They’ll live on my desk, with the Filofax. If I don’t lose them, they’ll all be around forever, which is more than you can say for an iPhone.